This capstone project, entitled, “Death: Reality vs. Reported,” prepared by four students for their Data Science in Practice course at the University of California, San Diego, bases its premise on an old study that compared the disparity of the number and causes of deaths reported by the Centers for Disease Control (CDC), and those reported in the media. In this case, the students have given the thesis an update: they have also included Google Trends Search Volume, but limited deaths reported by media to two sources: The Guardian, and The New York Times. If you’re reading about the rising number of measles cases in California, you may also be thinking about pandemic risk. 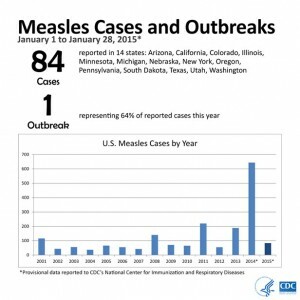 First, let’s look at the status of measles cases and outbreaks in the United States. 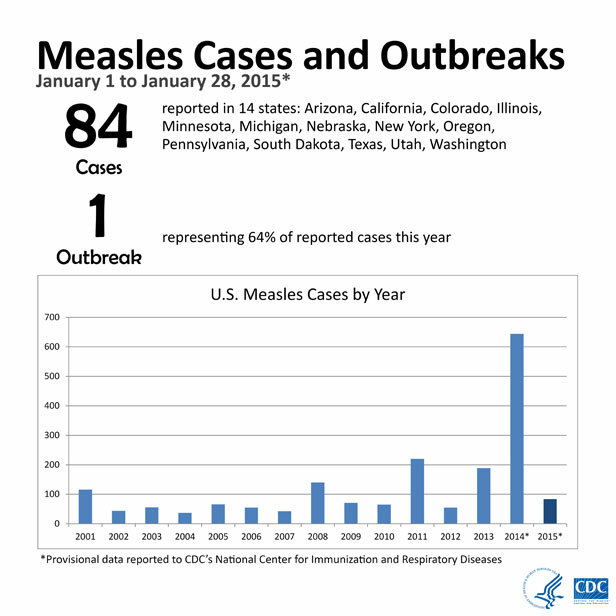 The CDC notes that from January 1 to January 28, 2015, 84 people from 14 states were reported to have measles. Most of these cases are part of a large, ongoing outbreak linked to Disneyland in California. On Friday (January 30, 2015), the California Department of Public Health released figures showing there are now 91 confirmed cases in the state. Of those, 58 infections have been linked to visits to Disneyland or contact with a sick person who went there. At least six other U.S. states — Utah, Washington, Colorado, Oregon, Nebraska and Arizona–as well as Mexico have also recorded measles cases connected to Disneyland, according to this AP report. The U.S. experienced a record number of measles cases during 2014, with 644 cases from 27 states reported. Many of the cases in the U.S. in 2014 were associated with cases brought in from the Philippines, which experienced a large measles outbreak, according to the CDC. Measles, which can be prevented by vaccine, is one of the most contagious of all infectious diseases. The virus is transmitted by direct contact with infectious droplets or by airborne spread when an infected person breathes, coughs, or sneezes. Approximately 9 out of 10 susceptible persons with close contact to a measles patient will develop measles, the CDC reports. This is an important point. A study published by Risk Management Solutions (RMS) last year compared the low transmissibility of Ebola (Ebola can only be transmitted through direct contact with bodily fluids), with other infectious diseases such as measles. RMS noted that each person infected with measles can generate on average more than 10 additional cases in an unvaccinated environment. Measles is one of the leading causes of death among young children, the World Health Organization (WHO) says. In 2013, there were 145,700 measles deaths globally–about 400 deaths every day or 16 deaths every hour. One or two out of every 1,000 children who become infected with measles will die from respiratory and neurologic complications, according to the CDC. One dose of the Measles, Mumps, Rubella (MMR) vaccine is approximately 93 percent effective at preventing measles, CDC notes, while two doses are 97 percent effective. Measles vaccination resulted in a 75 percent drop in measles deaths between 2000 and 2013 worldwide, WHO reports. A CDC-issued health advisory here provides guidance to healthcare providers nationwide on the multi-state measles outbreak. The potentially devastating impact of the rapid and massive spread of infectious diseases was a risk underscored by respondents to the recently released World Economic Forum (WEF) Global Risks 2015 report. This reflects the need for a higher level of preparedness for major pandemics at both the country and international levels, the WEF noted. The I.I.I. has facts and statistics on mortality risks here. A global pandemic is the most important extreme risk for the insurance industry to worry about in the long term, according to a survey of global insurance industry executives conducted by Towers Watson. Rounding out the top three extreme risks of concern are a large-scale natural catastrophe and a food/water/energy crisis, the survey found. Other top 10 extreme risks named in the Towers Watson survey include cyber-warfare, an economic depression, a banking crisis and a default by a major sovereign borrower. Votes were compiled in a wiki survey which enabled participants to add their own ideas. Over 30,000 votes were cast. Meanwhile, a new report by AonBenfield says pandemic risk remains the most important mortality exposure for the insurance industry and is placed above other forms of catastrophic event including natural catastrophes, nuclear explosions, and terrorism. In Pandemic Perspective, AonBenfield points out that according to historical data, pandemics are large enough to destabilize the insurance market more than once every 200 years, with three global pandemics recorded in each of the last three centuries.